In the seven summers that we’ve been here at the Inn on Mill Creek Bed & Breakfast, we’ve noticed from time to time in the pond a dark object just below the surface of the water, a submarine-like being, which occasionally sends up its periscope to check around, only to quickly sink back beneath the depths when spotted. 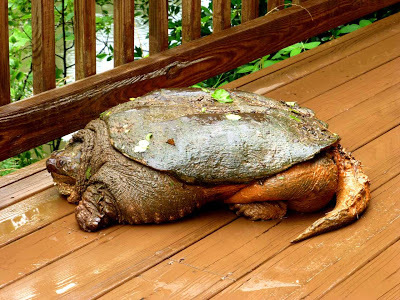 OK, maybe Innkeeper Brigette has been reading too much about the Hunley Submarine in anticipation of a little innkeeper R&R (roadtrip and relax) vacay to Charleston later this year… But our resident snapping turtle had yet to make a real appearance, other than sticking its long neck out of the water. Until this week. Our guests, Jud and Shelley, were the first to notice him (her? We’ll say “him” for now). 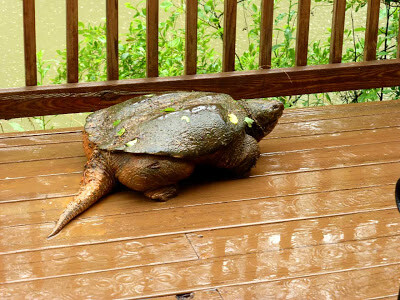 The turtle walked onto the deck outside their room on a rainy July 4th afternoon and decided to hang out for a few hours, long enough for us to ooooh and ahhhhh, and for Innkeeper Dave to measure it with a measuring tape (two feet long, 18″ wide) and take lots of photos — at a safe distance, of course (1″ claws, and a serious overbite). 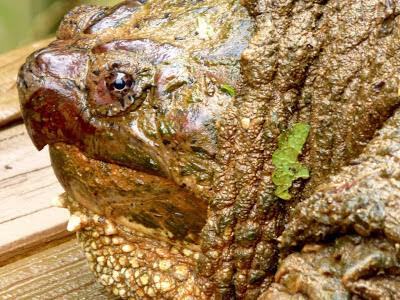 We’d love to know how old this guy is. 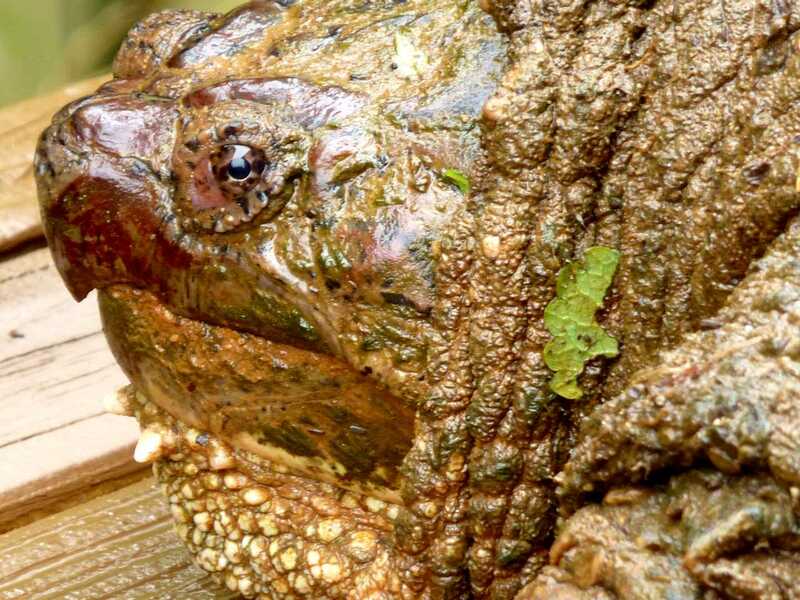 In doing some internet searching, we located a really thorough website — Tortoise Trust — that says mature, older snapping turtles have smoother shells than younger ones, which describes our snapper. 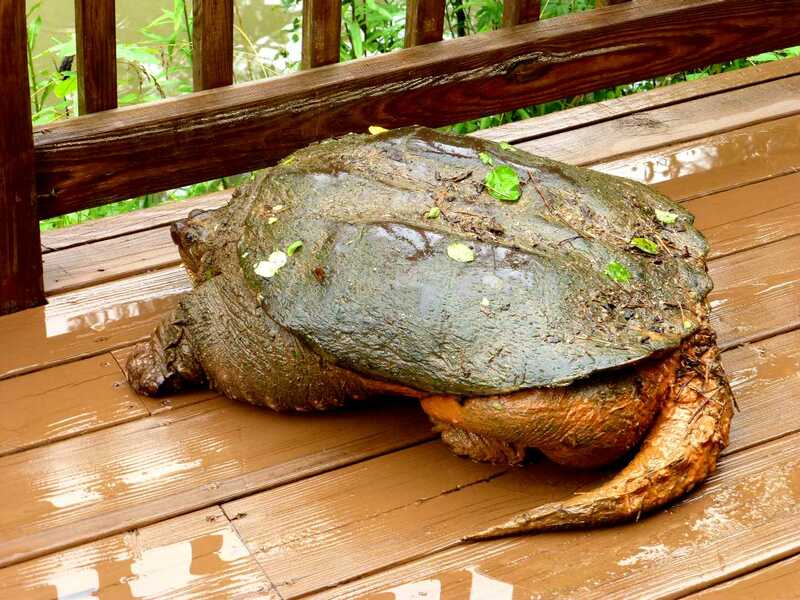 The website also says the the heaviest snapping turtle caught in the wild weighed 68 pounds. Ours looks a bit hefty…well-spoiled obviously by all the vegetation and little frogs and such here at the pond next to Inn on Mill Creek, tucked inside North Carolina’s Pisgah National Forest. How much do you think he weighs? We’re guessing about 50 pounds. 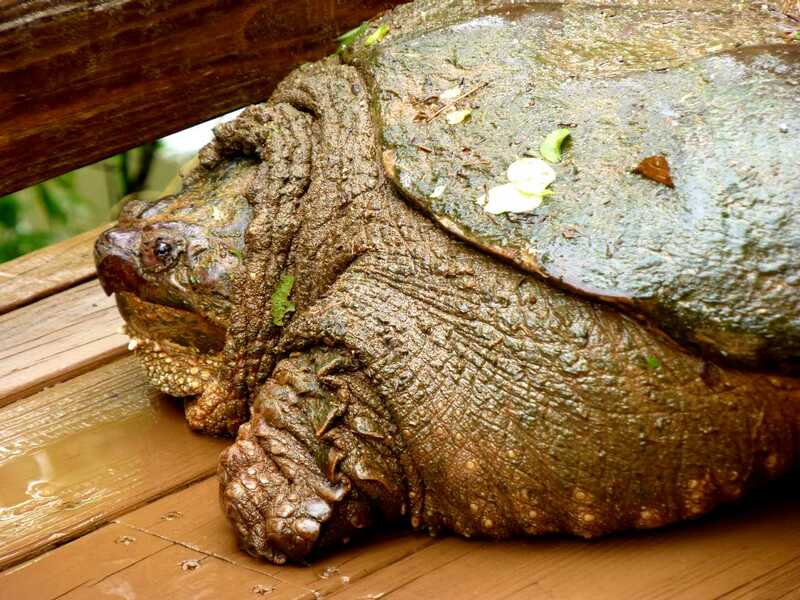 Since his relaxed, lackadaisical demeanor and marshmallowy body type remind us of our big fawn pug, Csaba, we considered naming our resident snapper Csaba II. However, we ultimately decided to name him Puffy, after our guest, Collin, used that word to describe Csaba the pug. So Puffy the Snapping Turtle it is. Here he is heading back home to the other side of the railing and the pond, moving at a snail’s — or rather, a turtle’s — pace. Good to finally see you, Puff. This entry was posted in Uncategorized and tagged flora and fauna, Old Fort / Andrews Geyser, outdoors by Inn on Mill Creek. Bookmark the permalink.